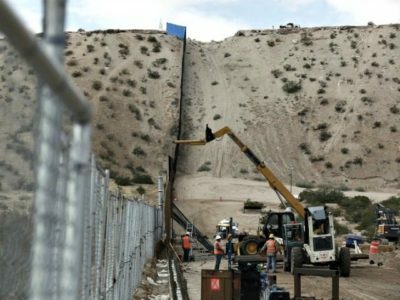 The owners of several Hispanic-owned companies bidding for contracts to build a wall or fence on the U.S. border with Mexico have been swamped with death threats, a report reveals. Owners of several construction companies in western states such as California and Arizona have reported a campaign of harassment after their names turned up in federal databases. There have been phone and email complaints, rocks thrown at buildings, death threats, and one company even said a company tractor was stolen, The Washington Post reported. According to a review of federal records, only 32 Hispanic-owned companies have thus far bid for any of the contracts currently offered by the federal government for Trump’s border wall. Michael Evangelista-Ysasaga, the owner of a construction company in Arizona, told the paper that Hispanics are calling him a traitor for bidding for the work. He noted that some Hispanics in the U.S. think it’s “racist” to want to secure the U.S. border. Evangelista-Ysasaga also told the paper that he has been deluged with calls from “random people calling into the office and just screaming.” There have been five threats this week alone, he admitted. “We’ve picked a very hot-button project to be involved in but at the end of the day, it is our hope that once we secure our border, we can finally pass comprehensive immigration reform,” Evangelista-Ysasaga added. Still, Mario Burgos, president of a firm out of Albuquerque, said his employees, Caucasian and Hispanic alike, just want to work. “Employees are happy to know there’s a possibility for work, whether they are Hispanic or not,” Burgos exclaimed.